I did the craziest thing the other night, and it had nothing to do with Las Vegas. And I guarantee Chris Berman would be proud of this play. Here’s what happened: I made these cookies but inadvertently took them out of the oven way too soon. After letting them cool for 10 minutes, Nate and I started to eat and realized they were, well, kind of gross. Which was so disappointing. After an hour of watching TV, I went back in to look at my sad cookies. I thought the game was over, but I decided to go for the Hail Mary pass. I re-pre-heated the oven, then put the cookies in for about 10 minutes. And, believe it or not, they came out perfectly! I still can’t believe it worked. The cookies were fresh but certainly no longer hot when I put them back in the oven. I’m not saying that anyone SHOULD cook their cookies this way…I’m just saying if you have nothing to lose, go for it! Jane, I will definitely try this trick of yours! I love your site and have been visiting it for a few weeks, but have never written. I had to write after reading about your cookies. This happened to me with a cheesecake recently and you know they can be finicky. I took it out of the oven when I thought it was done, turned the oven off, cleaned it(butter had seeped out into oven) and then decided the cheesecake wasn’t done. I had no choice but to preheat the oven again and put it back in for a while longer. I thought for sure it would be ruined, but it turned out perfectly! I even served it to company (the kind of company that will eat your mistakes-close friends) and they loved it too! Goes to show…it can be done. 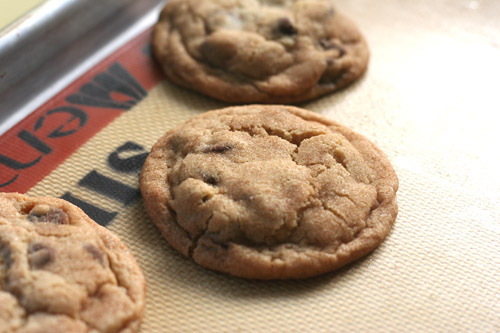 Let me just say- that cookie looks so good….